I got some wonderful Christmas Presents this year, from friends all over the world. 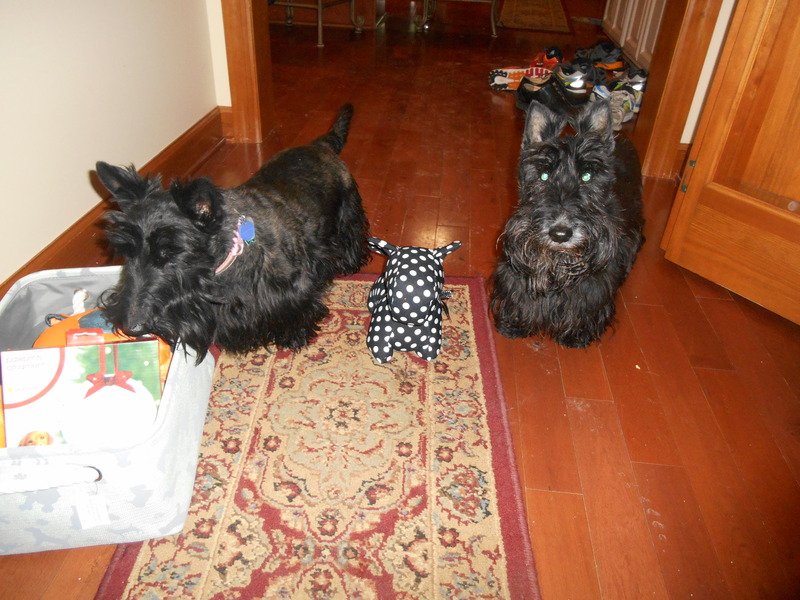 Last week, I got a big box from good friends Princess Peyton and Handsome Jack in Chicago- and in there was the new addition to my staff, Senor Polka Dot Scottie. That’s me to the right (Since I am not Festively Plump, and Ainsley is becoming heavier by the minute, we are harder to tell apart), Senor Polka in the middle, and Ainsley looking in the box for more stuff from Princess Peyton. Next Post Breakfast time, ya’ll! I do not like the title to this post, Angus! Hmmmmm. Are you certsin that there’s no more? Senor Polka Dot’s brother lives in our house, we call him Senor black with white spots..lol. Well..you do know Commanding Officers need to stay Fit and Trim! Keep Señor Polka Dot in line. It seems your 12 days of Christmas have stretched quite a bit. Senor Polka can do sentry duty with Mr. Bear.